Long live the iPod nano! I still use an iPod as my main source to listen to music. I do keep some music on my iPhone and iPad, but maybe only about 100 songs or so. Although I do admit to using streaming services like Sirius XM, Spotify, Amazon Cloud Player and Google Music from my iPhone and iPad. I’m slowly warming up to having my music in the cloud, but still prefer the offline music that my iPod nano holds. I’ve been using MP3 players for years, like the Rio and then in 2004 with my first iPod 20gb. Over the years, I’ve upgraded my iPods to where today I use both an iPod nano 5th gen and 7th gen. The 5th gen nano is mostly in my car, connected to the USB port. It’s very cool to have 14gb of music available to me at all times while driving. 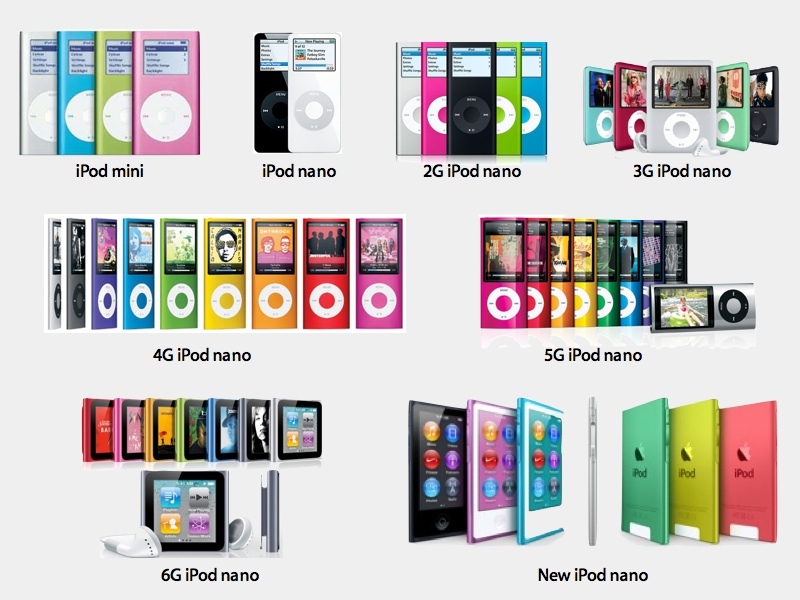 From the picture above, I’ve owned several iPod nanos – from the 4th generation to the latest 7th gen. I didn’t own any iPod nano model prior to the 4th gen model. I was still using the full size iPod, mostly due to space. Of note, I also have never owned the iPod Classic. As for the 7th gen nano, which I reviewed here some years back, is used for all of my podcasts and music when I go to the gym. I also use it when mowing the lawn, which along with an alcoholic beverage or two, gets me through the weekly task. The biggest advantage of the iPod nano for me is not having to connect to any service. It’s music and podcasts without needing a data connection. The downside is having to physically sync via USB to my MacBook Pro 15″. Which I don’t mind doing a couple times a week to get updated music and podcasts. As I mentioned above, I do use a few streaming apps, mostly on my iPhone and sometimes with the iPad. I don’t see this replacing my iPod nano anytime soon, but as the streaming services become more commonplace, I can see how it will creep into my music listening. Anyone else out there still tied to their iPod? Share your thoughts below. The only nano I own is the original nano. I loved it, but the face scratched ridiculously easy so I connected it to my car stereo (the scratches are thus unseen in my glove box). It’s been there ever since… still working! Most of my music-listening outside of the car is on my Mac at work. Then my iPhone when I travel. I had a friend who got the first gen nano. The biggest issue with it was that it felt cheap, both on the front and back side (all plastic) that got easily scratched. The car is a great place for that. My mom has the old Mini and Katie has either the 4 or 5G but I’m not sure which. My fave was always the 3G. Loved that stubby. I have a 160GB Classic that is used to tote all my music although it hasn’t been synced in months. Really need to get on that. I thought about getting the 3G stubby, but never did. I was still using my iPod 5th gen 30gb. My daughter has the 160gb Classic. I also have the same model iPod as Mr Apgar. Goes with me everywhere. I sync it every night so that the tracks I play get scrobbled to last.fm. Cool. Sure would be nice if they did one last update to it by putting a 250gb drive into it.